Welcome back to Stuff & Nonsense, Carrie! My first interview with you posted on Monday, March 26, 2012, almost seven years ago! Would you like to give us a glimpse into your writing career over these last seven years and where you see yourself in another seven? Thank you, Anne. It’s been a busy seven years for me! I’ve released five novels and three novellas since that last interview. All five novels have been English historical romances set in the early 1900s: The Governess of Highland Hall, The Daughter of Highland Hall, A Refuge at Highland Hall, Shine Like the Dawn, and Across the Blue. The novellas were Moonlight Over Manhattan, Waiting for His Return, and A Trusting Heart in Mountain Christmas Brides. Looking toward the future, I have four novels coming out this year. 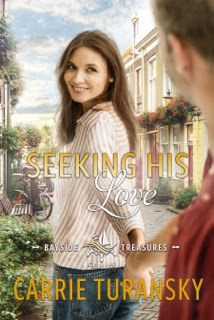 Three are contemporary romances in the Bayside Treasures series: Seeking His Love, A Man to Trust, and Snowflake Sweethearts. 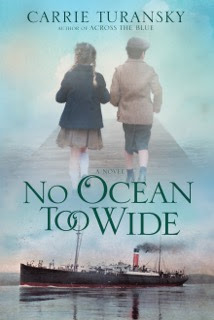 The fourth novel, No Ocean too Wide, is an English and Canadian historical novel that is inspired by the child emigration scheme that sent more than 100, 000 poor and orphaned children from England to Canada in the late 1800s and early 1900s. I’m currently writing a sequel to that book and after that ... we’ll just have to wait and see what’s next. I have read and loved ALL of your historical novels! They are beautiful stories. You write both contemporary fiction and historical fiction equally well. Do you favor one genre over the other? I enjoy writing both historical and contemporary stories. It’s been fun to be able to move back and forth between time periods and to write both novellas and novels. I do love historical research and discovering fun and interesting events in history, so if I had to choose, I’d say writing historical novels is my favorite. I can always tell that you've put a lot of time and effort into your research. It's what makes your stories incredibly real! Is there one theme you lean towards including in your stories more than another? If so, why do you think that is? I often weave in the theme of God’s faithfulness by showing how He can take the hard and painful things in our lives and turn them around for good. Forgiveness and second chances are also themes you’ll often find in my stories. Wouldn’t that be fun to see it made into a Hallmark movie! I think Natalie Portman would make a great Rachel Clark and Henry Cavill would be a terrific Cam McKenna. working on right now? When does it release? I’ve just finished the final edits on No Ocean too Wide, the first McAllister Family Novel. Here’s a bit about the story: When Laura McAllister, a young lady's maid, learns her three siblings have been taken from their mother and immigrated to Canada without her mother's knowledge, Laura determines to search for them and reunite the family. But lack of funds and resistance from authorities push her to use a false name and take a position with a child emigration society to gain passage to Canada. 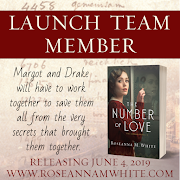 Andrew Frasier, a wealthy young lawyer, is surprised to see his mother's former lady's maid on board ship escorting a group of child immigrants, especially when she uses a different name. Laura eventually convinces Andrew to help her search for her siblings and uncover the truth about the treatment of British Home Children. Romantic feelings grow between this unlikely couple, and though they have different backgrounds, they share a growing faith and desire to seek justice and relief for the children who are mistreated. Ooooo...That sounds fascinating!!! Do you have a book you’re looking forward to reading? Karen Barnett’s Ever Faithful and Lori Benton’s The King’s Mercy are both coming out in June from WaterBrook, and I’m excited to read those stories! I have never read a book by either one of those authors but always hear good things about their stories. Guess I should add them to my must-read list. Where can you be found on the Internet? Thank you again for sharing what’s been happening in your writing career, Carrie! Readers, I hope you’ll pick up Carrie’s books because you can depend on them to be Christian and filled with beautiful stories of hope! Turansky has written a sweet novel about forgiveness and redemption. Vivid word pictures put me right in Fairhaven, making me want to visit this quaint town and get to know its residents. Rachel has a heart for the Lord and follows him with a sincerity I admired. My favorite thought of hers was this—But she was definitely not going to let herself get carried away with romantic daydreams about him. She had no idea where he stood spiritually. And that was much more important than outward appearance or superficial kindness. I was glad to see a heroine with godly character and self-control, which of course comes from her knowledge of the Word of God and her relationship with Christ. Is Rachel perfect? No. She has flaws like we all do but as Christians we are called to be set apart from the world and this is how she behaves–set apart. Cam has suffered a devastating loss and basically walked away from the Lord. When he comes to the realization that God has never left him, his restoration is moving and realistic. I liked Cam’s character a lot. My review is based on a revised and updated version of Seeking His Love provided by the author. I read the original back in 2010 or 2011. No review required. No compensation received. 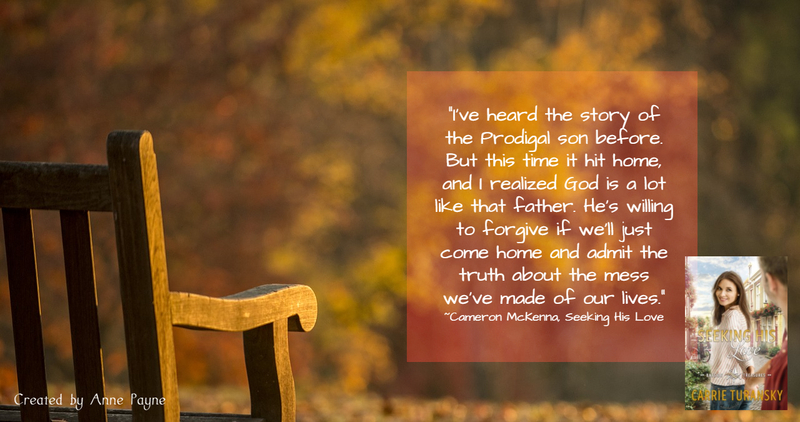 EXCERPT: Click here to download an excerpt of Seeking His Love. I am giving away a $5.00 Amazon e-gift card to one of my blog readers because I appreciate y'all and it's almost Valentine's Day!!! Please be sure and leave an email address in the comments so I can send you your e-gift card in a timely manner. I won't hunt anyone down if there is no email! I'll draw a winner on Valentine's Day!!! This is a wonderful interview ladies! It was fun to show the progress in Carrie’s writing career and hear more about her books. She inspires me! 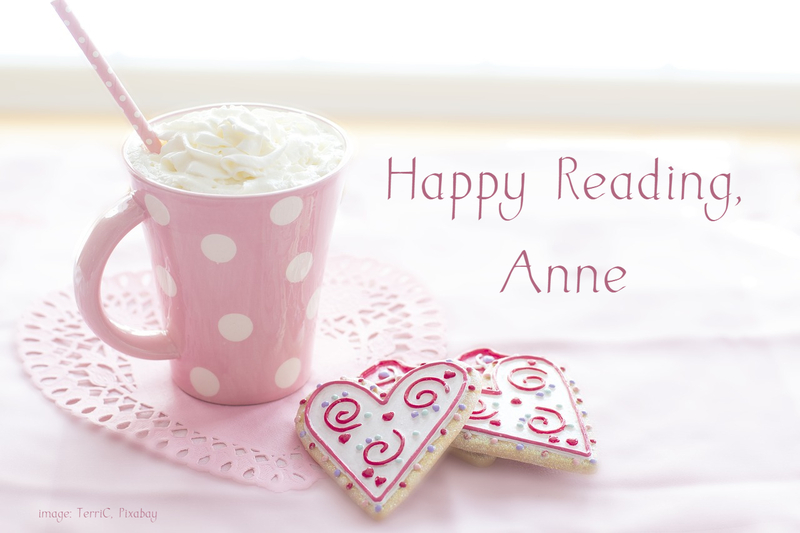 Anne, you are the ever faithful cheerleader of Christian fiction! Good morning, Carla! Thanks so much for stopping by. I know you are busy writing too. 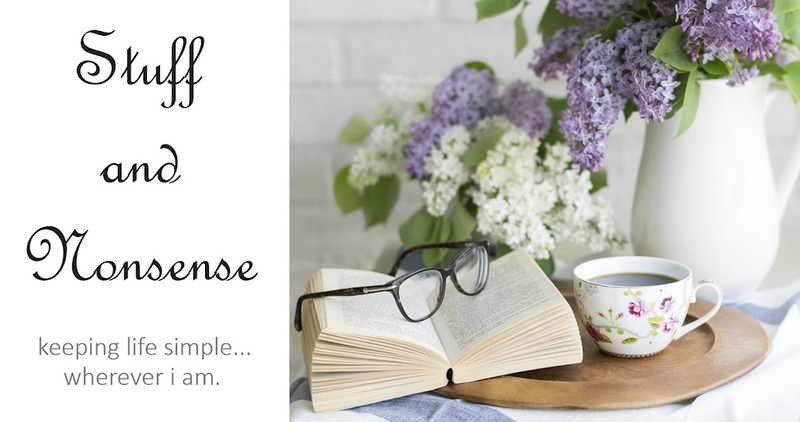 I am honored to be able to share my love of Christian fiction and introduce my readers to the fabulous authors behind those books. If you're entering the giveaway please come back and leave an email. I don't recognize your username. I love learning about authors too. TY for coming by today, Jan. Thanks for the post! Enjoyed Seeking His Love. Am following you on GFC. Thanks, Mindy! It's a sweet book. I read Carrie’s book and really liked how the troubled teenager was handled. Great book! Paula, I enjoyed that too. There was so much depth to this story. Happy Valentine's Day to you too, my friend!! Great interview, Anne and Carrie! I love Carrie's books & look forward to reading No Ocean too Wide. I'm looking forward to reading No Ocean Too Wide as well, Tina. Carrie really does shine when it comes to historical romance. Happy Valentine's Day to you too!! 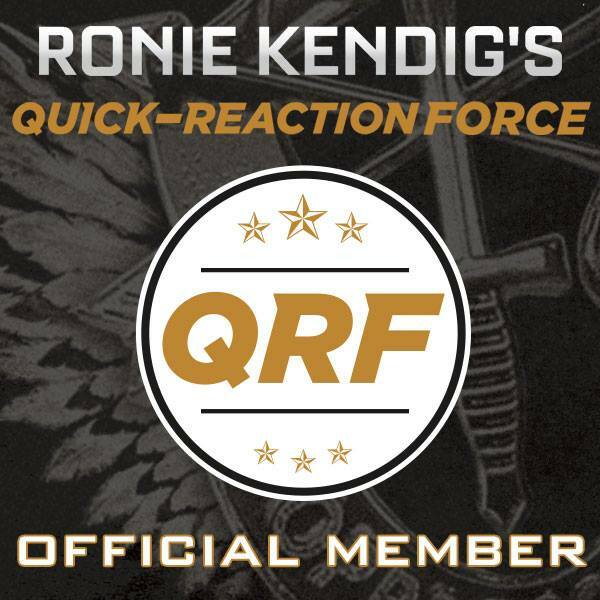 New GFC follower here! 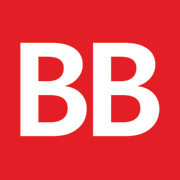 Enjoyed your post and looking forward to visiting your blog again. Thanks for following! Appreciate your visit. I am so grateful that we’ve been blessed with all of your beautiful books, Carrie! Thanks for sharing with us about your new ones! Anne, I don’t use GFC but I follow you by email! Have a wonderful Valentine’s Day, ladies! Thanks for coming by and leaving a comment, Karen. Appreciate your kind words. Hope you have a wonderful week! Happy Valentine's Day! 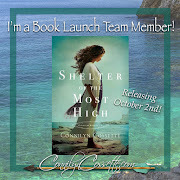 Thanks for sharing about Carrie's new book! Happy Valentines Day. Reading is my absolute favorite. I love reading new authors books. The interview with Carrie was so sweet. I'm glad we could introduce you to Carrie! I read and enjoyed the original Love Inspired of this book. It's always heartening to hear about authors getting their books reprinted independently, so that their books can stay in circulation. I didn't realize that this one is an updated and revised edition. That's good to know. This was from Carrie about the updates in the book "I revised and updated some of the elements in the story. So it's the same story, but revised as far was writing style and updated some technology." So, nothing drastic, still her sweet style and story! I have not had the opportunity to read any of Carrie's books... 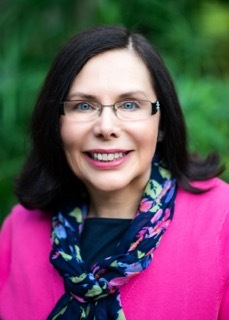 But I can definitely recommend Lori Benton, one of the authors she is looking forward to reading next. Thanks for the fun interview with Carrie! I love her books, and she is such a sweetheart! Yes, we are big fans of hers! Hey Anne and Carrie! Thank you for the fun interview! Carrie, is one of my must read authors. Lovely interview. I am really looking forward to reading this . I love romance novels! Thanks! I love how Seeking His Love points so assuredly to the greatest romance, God's love for his children! Alison, I think there are many fans of Carrie's waiting on pins for the release of No Ocean Too Wide. :-) Happy Valentine's Day to you too!